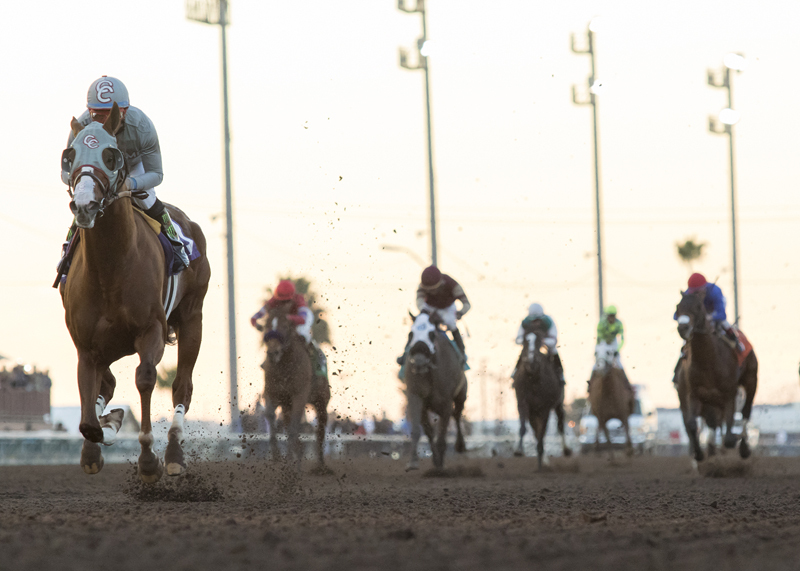 Before an enthusiastic on-track crowd of 5,023, California Chrome put on a show in his first start at the track where he has trained since January, 2014 in the $180,000 Winter Challenge Saturday at Los Alamitos. The overwhelming 1-20 favorite in his final race in California, the 5-year-old son of Lucky Pulpit cruised past nine outclassed rivals in his prep for an anticipated rematch with Breeders’ Cup Classic winner Arrogate in the $12 million Pegasus World Cup Jan. 28 at Gulfstream Park. Outrun early after breaking from the outside in the field of 10, California Chrome was kept in the clear and extremely wide by jockey Victor Espinoza, wanting to avoid any possible traffic problems. Fifth after the opening half-mile, the 2014 Horse of the Year and world’s richest active thoroughbred moved up to join the leaders without urging, swept to the lead with about 2 ½ furlongs to run as the cheers and noise level from his loyal supporters – affectionately known as Chromies – began to increase.From there, it was just a matter of what the margin of victory and the final time for the 1 1/16 miles would be. California Chrome’s 16th win in 26 starts saw him finish a dozen lengths in front of 21-1 second choice Point Piper. He stopped the clock in a track record 1:40.03, breaking the old mark of 1:40.82 set by Uncle Lino April 30 in – ironically – the California Chrome Stakes. Trained by Art Sherman for Taylor Made Farm and co-breeder Perry Martin, California Chrome paid $2.10 in a race that featured only win wagering. The $50,000 payday pushed his earnings to $14,502,652. “I was pretty nervous before the race,’’ said Sherman amidst a throng near the winner’s circle. “You know your horse is better than the others running in the race, but it is a horse race and anything can happen. (Espinoza) rode him with a lot of confidence. “You could see he was much the best. I told Victor keep him in the clear and don’t get him in any trouble. He rode him like he was about 10 lengths the best horse. It was just perfect. “Now I can relax and get ready for the Pegasus. I want Arrogate bad. I have something in my heart that says Chrome can beat him. “The atmosphere here was just wonderful. It did my heart really good to be able to see him run in front of Orange County people. They are such loyal fans. This was a great day for racing. You can see what happens when you have a star. Espinoza was also pleased with how the race will set California Chrome up for his finale in Florida. 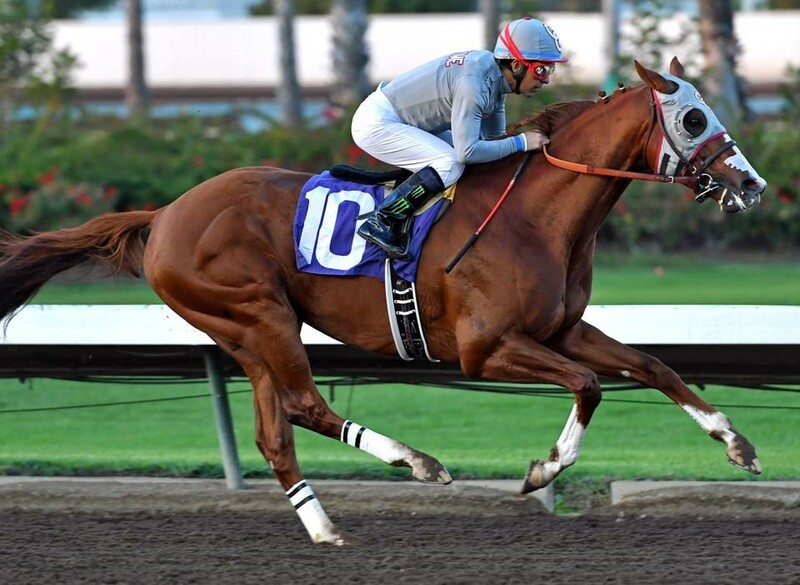 California Chrome is scheduled to begin his stud career in Kentucky after he competes in the Pegasus World Cup. “When I got on him today he was stronger and it really surprised me,’’ said Espinoza. “When that happens I have a lot of confidence. Point Piper, who was an easy winner of the Grade III Longacres Mile Aug. 14 at Emerald Downs, banked $30,000 for finishing second while winding up 3 ¼ lengths in front of 98-1 shot Papacoolpapacool, who was making only his second career start on dirt. Papacoolpapacool, a 4-year-old Temple City gelding, earned $20,000. Ain’t Misbehavin collected $20,000 for finishing fourth and Avanti Bello, the third choice at 22-1, earned $15,000 for his fifth place effort. The remaining five – Presidentsky, Howdy, Wrightwood, Lucky J Lane and Unusual Meeting – in the field earned $10,000 apiece. In the day’s other stakes event, Sircat Sally, who was stretching out after an impressive debut winner, was also a 12-length winner, leading virtually throughout as the 1-2 favorite in the $100,000 Soviet Problem. Trained by Hall of Famer Jerry Hollendorfer for owner-breeder Joe Turner, the 2-year-old daughter of Surf Cat quickly assumed control from 17-1 shot Cash Prize, then simply improved her position the rest of the way in dominating five other California bred fillies. Ridden by Drayden Van Dyke, Sircat Sally, who is out of the In Excess mare Sister Sally, completed the distance in 1:35.42, the fastest clocking for the Soviet Problem since the race was lengthened to one mile in 2014. It was run at seven furlongs in 2012-2013 at Hollywood Park. Sircat Sally, who won by five lengths in her debut at six furlongs Nov. 20 at Del Mar, has earned $88,200. She paid $3, $2.60 and $2.20. Cash Prize, the second longest shot in the field and a winner at Los Alamitos in her Sept. 17 initiation, returned $9.40 and $6.20 while finishing 1 ¼ lengths in front of 7-1 shot Bella Luma. The show price on Bella Luma was $3.60. Racing resumes Sunday at Los Alamitos. Post time for closing day of the Winter Thoroughbred meet is 12:30 p.m. The feature event on the nine-race program is the $100,000-guaranteed King Glorious Stakes. The one mile race is for 2-year-olds bred or sired in California.